Exploration and discovery in Southeast Asia! Explore four stunning Southeast Asian countries in one epic group trip! 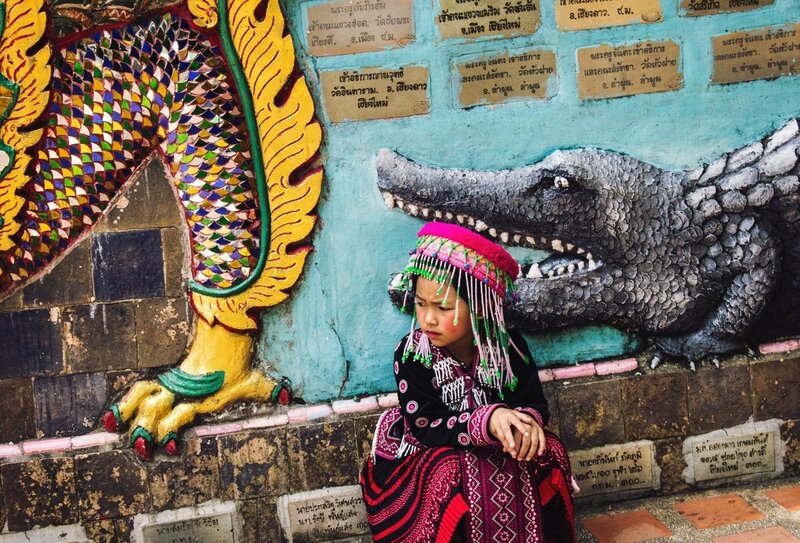 Discover the delights of Thailand, Laos, Cambodia and Vietnam and enjoy a host of unique cultural experiences and adventure activities. Meet elephants in Thailand, party in Laos, cruise Ha Long Bay in Vietnam and enjoy blissful beach time in Cambodia. 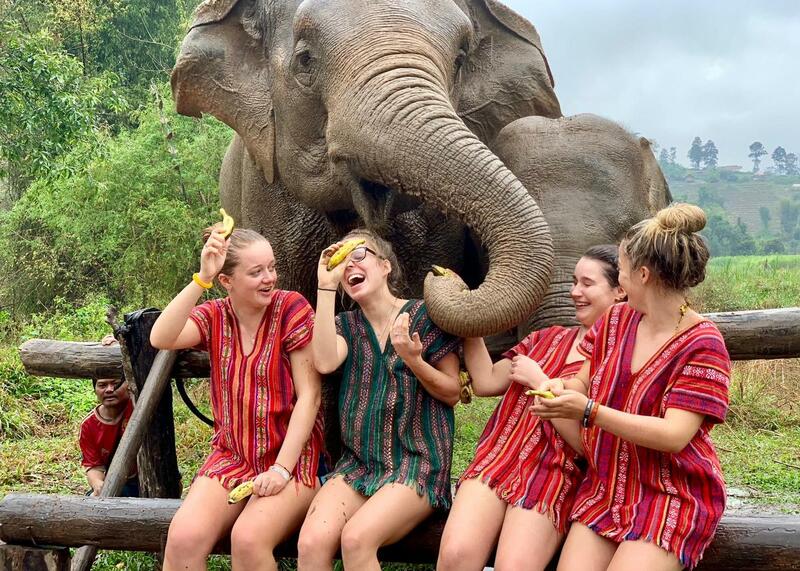 Perfect if you're travelling on a budget, this incredible 31 day trip ticks all the boxes, and will surely make you fall in love with beautiful Southeast Asia! Tick off four stunning Southeast Asian countries, including Thailand, Laos, Cambodia and Vietnam! Meet elephants at a sanctuary in Thailand! Budget Brilliance: Simple accommodation and optional activities make this adventure perfect for those travelling on a shoestring! Day 1: Arrive in Bangkok, and meet your group to start the adventure! Day 1: Arrive in Bangkok, and meet your group to start the adventure! Day 2: Have the day to explore this awesome city, before catching a night train to Chiang Mai! Day 2: Have the day to explore this awesome city, before catching a night train to Chiang Mai! Day 3: Roll into Chiang Mai in the morning, before heading out to meet elephants at a local sanctuary! Day 3: Roll into Chiang Mai in the morning, before heading out to meet elephants at a local sanctuary! Day 4: Have the day to explore incredible Chiang Mai! Why not try whitewater rafting? Day 4: Have the day to explore incredible Chiang Mai! Why not try whitewater rafting? Day 5: Have the day to explore the colorful city of Chiang Mai! Day 5: Have the day to explore the colorful city of Chiang Mai! Day 6: Leave the city behind and head to the peaceful Thai countryside! Day 6: Leave the city behind and head to the peaceful Thai countryside! 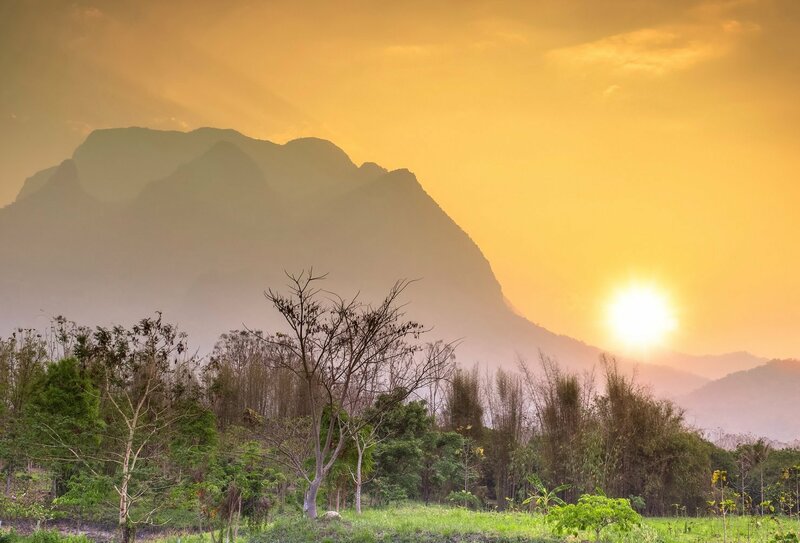 Watch the sunrise in Chiang Dao! Day 7: Watch the sunrise over the trees, then trek through the lush jungle! Day 7: Watch the sunrise over the trees, then trek through the lush jungle! 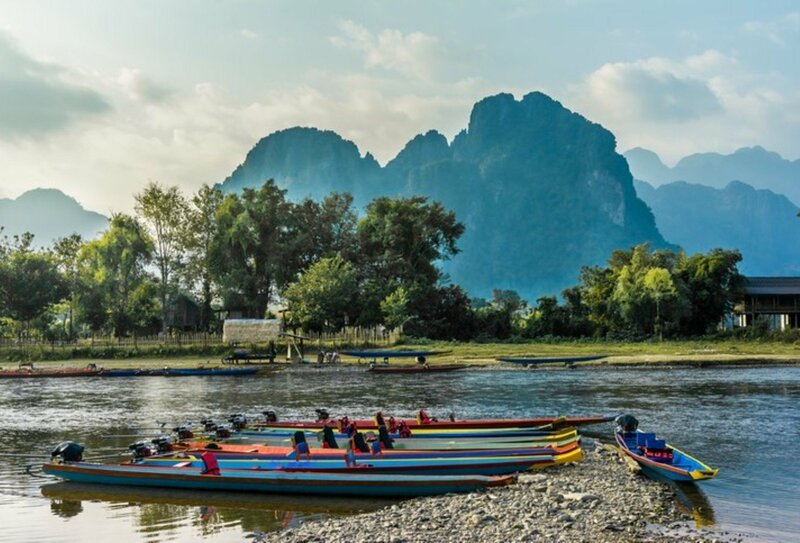 Hop the border into Laos, and jump on a slow boat to take in the amazing surroundings! Grab a bargain in Laos! 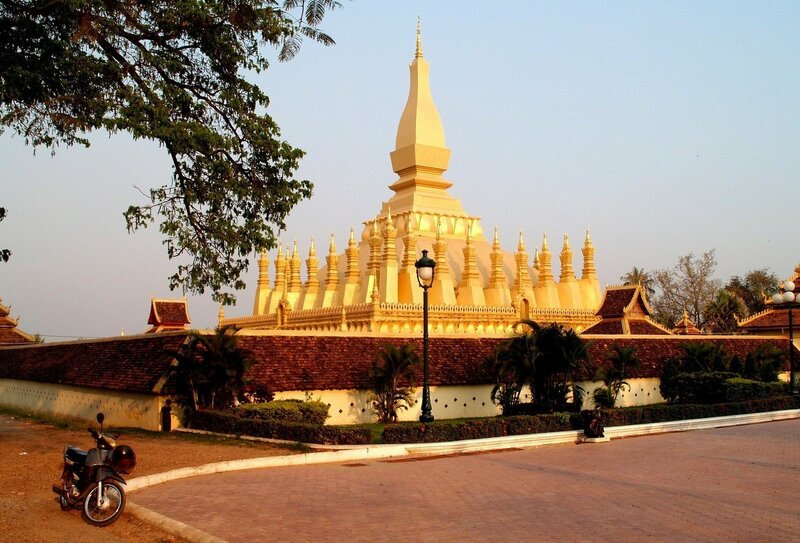 Day 9: Cruise into Luang Prabang, Laos's ancient royal capital! Day 9: Cruise into Luang Prabang, Laos's ancient royal capital! 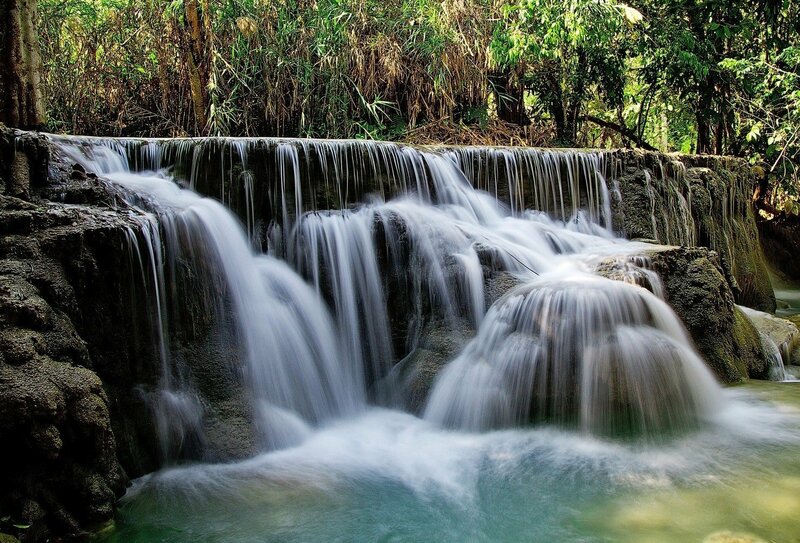 Day 10: Volunteer with local kids, before cooling off in the stunning Kuang Si waterfalls! 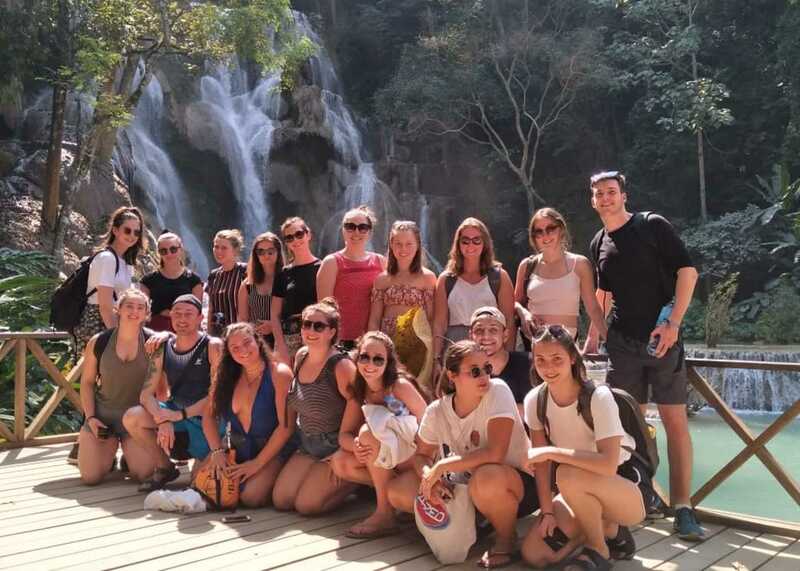 Day 10: Volunteer with local kids, before cooling off in the stunning Kuang Si waterfalls! Day 11: Head to Vang Vieng, and have the afternoon to explore this backpacker hub! 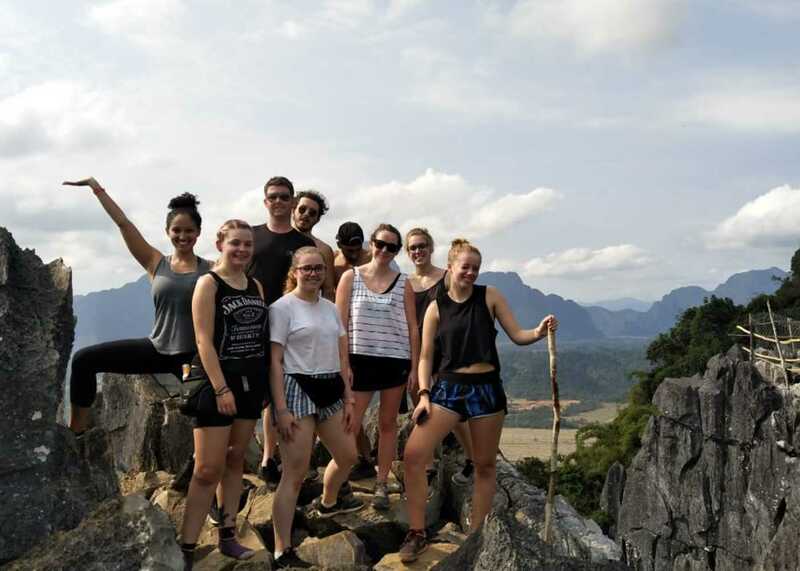 Day 11: Head to Vang Vieng, and have the afternoon to explore this backpacker hub! Day 12: Have the day to explore the city! Day 12: Have the day to explore the city! 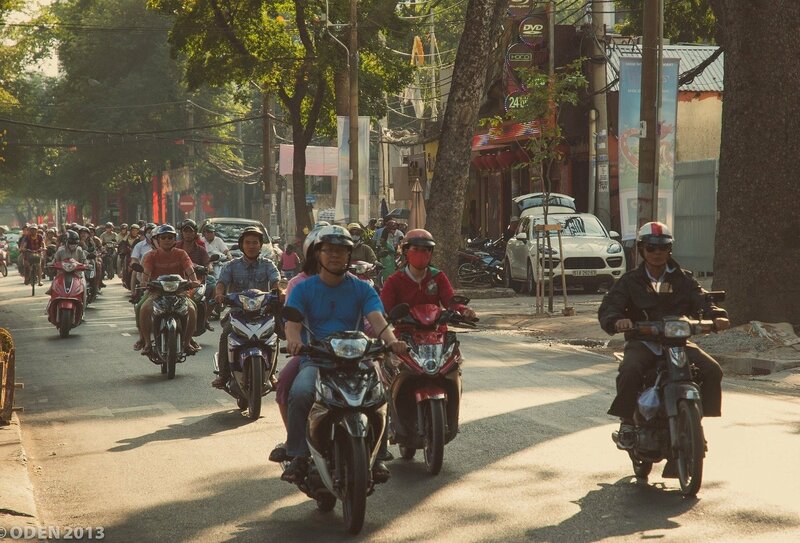 Day 13: Hop on a flight to Hanoi, and get involved with a bar crawl around the old quarter! 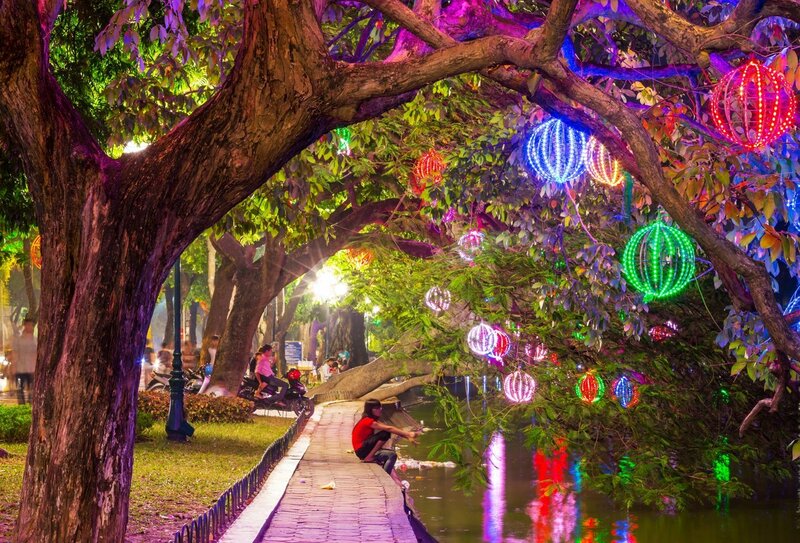 Day 13: Hop on a flight to Hanoi, and get involved with a bar crawl around the old quarter! 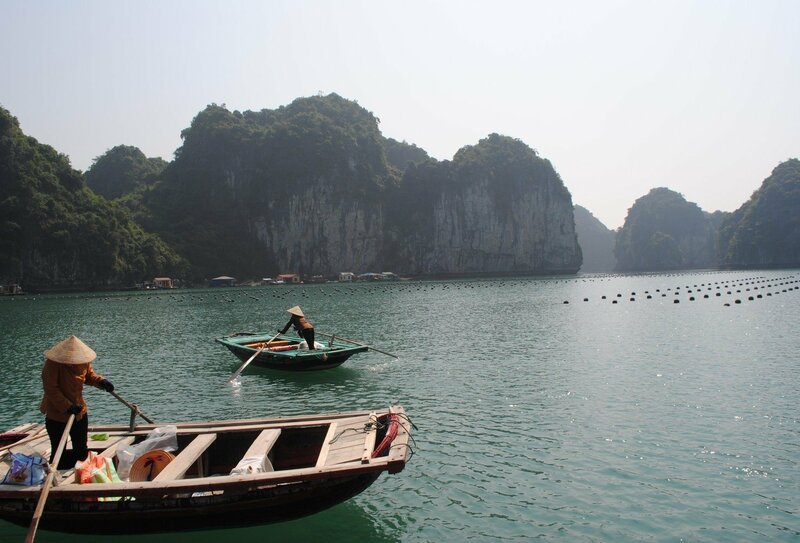 Day 16: Travel to the amazing Halong Bay and cruise it's thousands of islands! 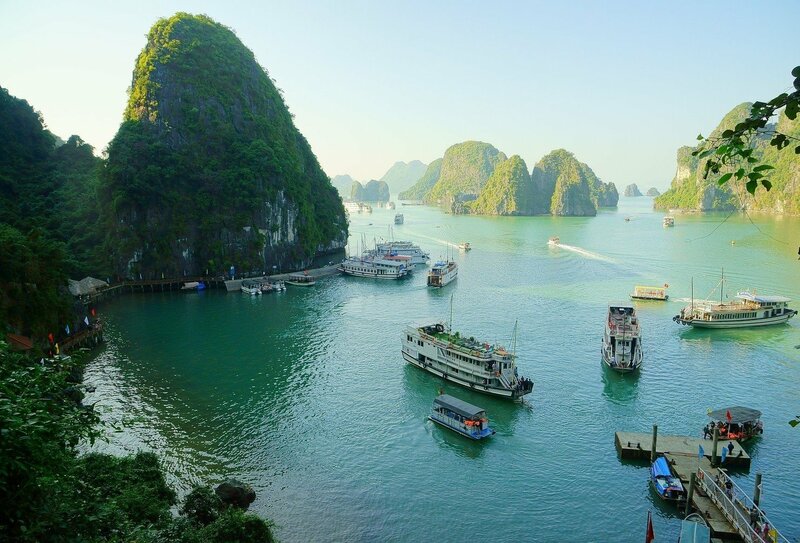 Day 16: Travel to the amazing Halong Bay and cruise it's thousands of islands! 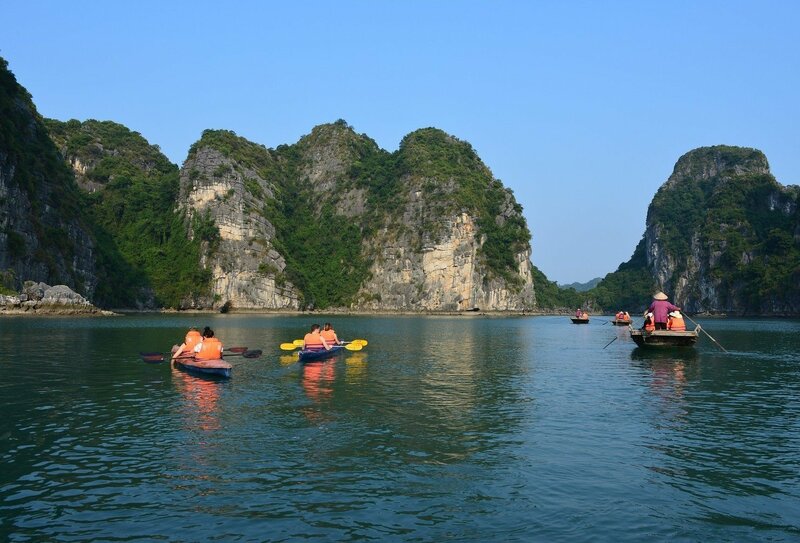 Explore Halong Bay with your group! Day 17: Kayak through the bay and keep an eye out for monkeys! Day 17: Kayak through the bay and keep an eye out for monkeys! Day 18: Cycle through the amazing countryside before trying group karaoke in the evening! Day 18: Cycle through the amazing countryside before trying group karaoke in the evening! 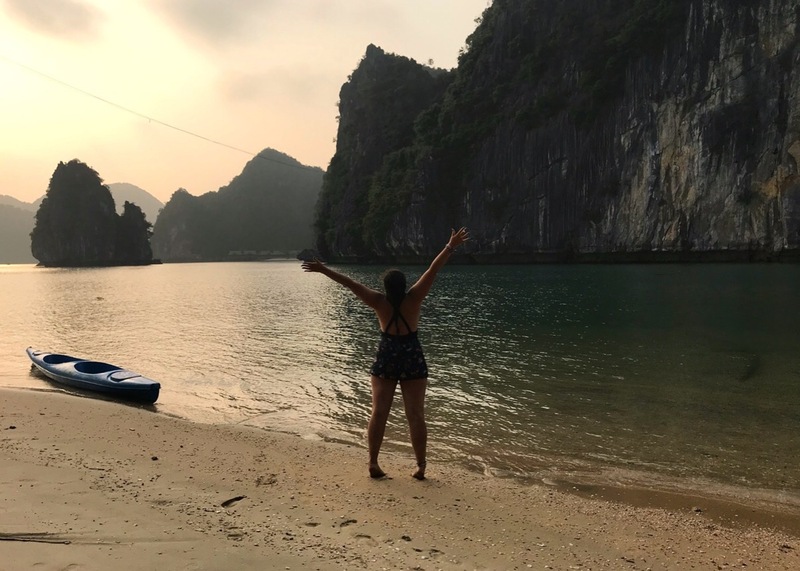 Day 19: Have a free day to explore Phong Nha! Day 19: Have a free day to explore Phong Nha! 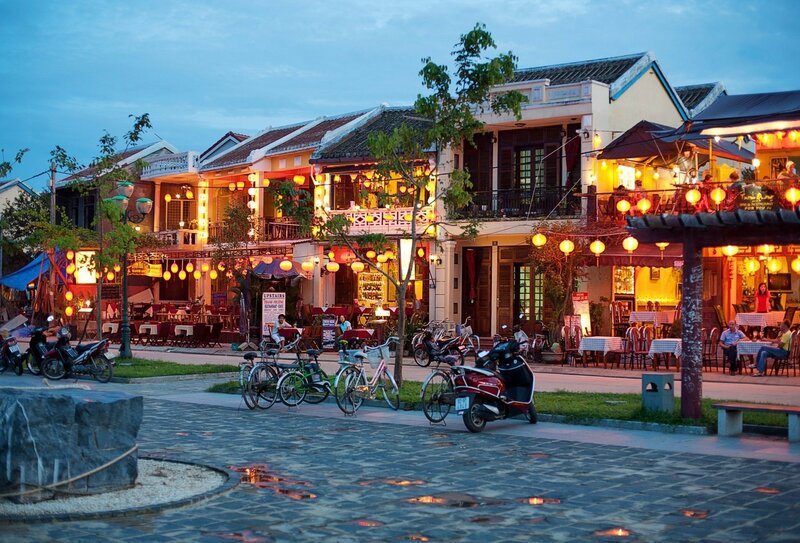 Day 20: Arrive in Hoi An, and have the day to explore the historic town! Day 20: Arrive in Hoi An, and have the day to explore the historic town! Day 21: Have the day to explore the amazing city of Hoi An! Day 21: Have the day to explore the amazing city of Hoi An! Day 22: Arrive in Ho Chi Minh City! Day 22: Arrive in Ho Chi Minh City! Day 23: Have the day to explore the city, and if you're brave enough, check out the wartime tunnels! Day 23: Have the day to explore the city, and if you're brave enough, check out the wartime tunnels! 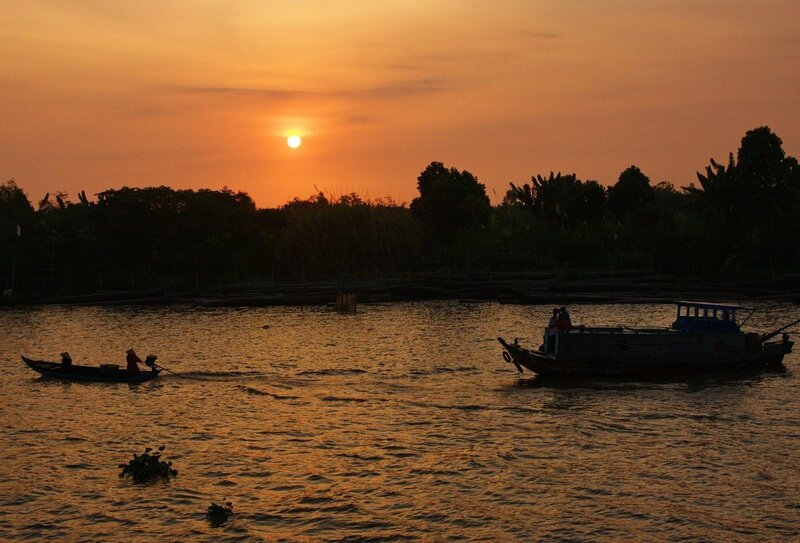 Day 24: Experience a more relaxed pace along the banks of the stunning Mekong Delta! Day 24: Experience a more relaxed pace along the banks of the stunning Mekong Delta! 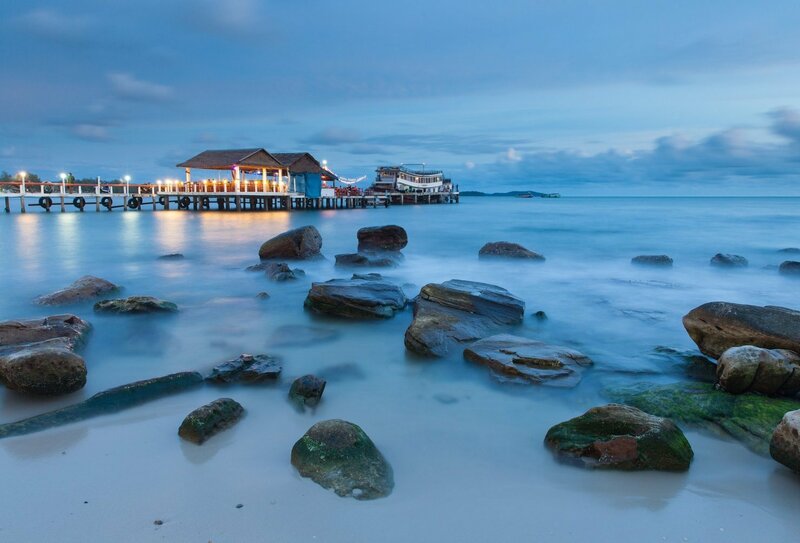 Day 25: Jump into Cambodia and chill out on Sihanoukville's stunning beaches! 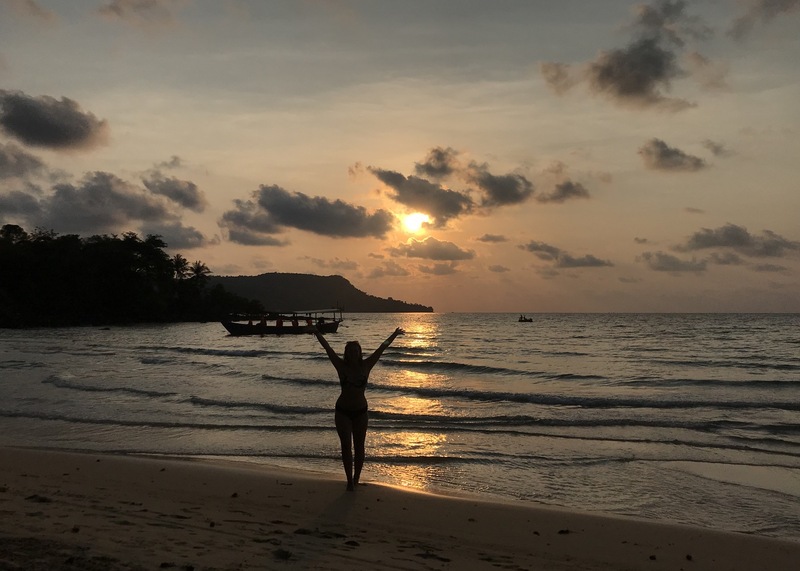 Day 25: Jump into Cambodia and chill out on Sihanoukville's stunning beaches! 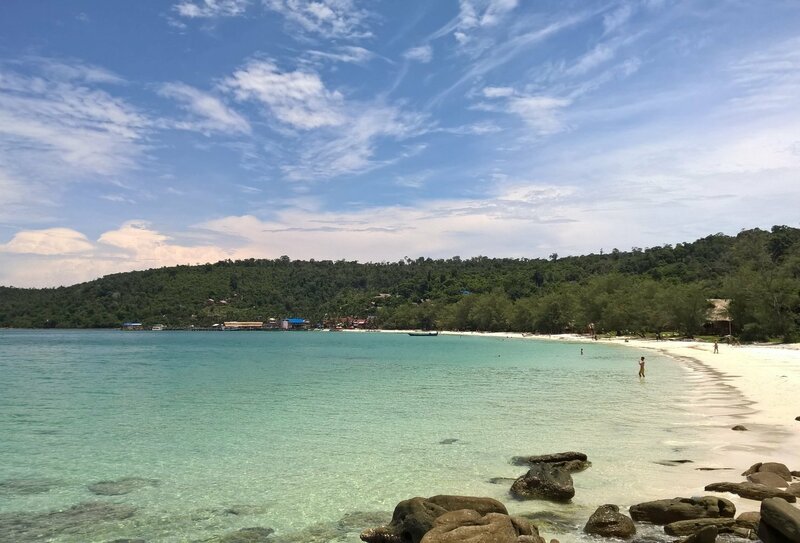 Day 26: Get into island life on Koh Rong today and relax! 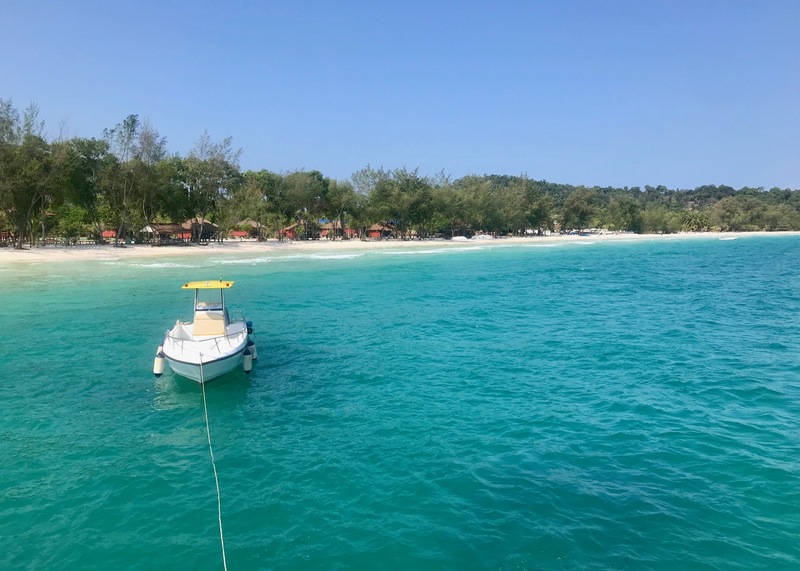 Day 26: Get into island life on Koh Rong today and relax! 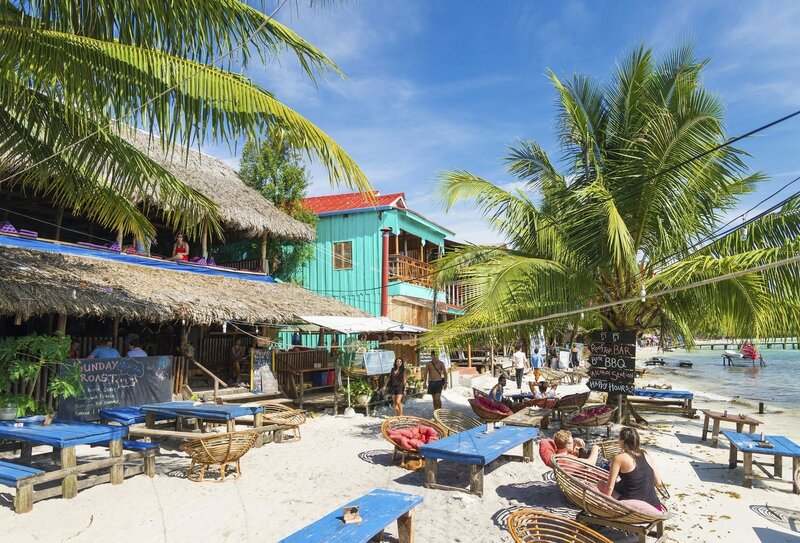 Chill out on Koh Rong's amazing beaches! Day 27: Cruise around perfect seas on a boat trip today, before heading back to Koh Rong! Day 27: Cruise around perfect seas on a boat trip today, before heading back to Koh Rong! Have fun in Koh Rong! 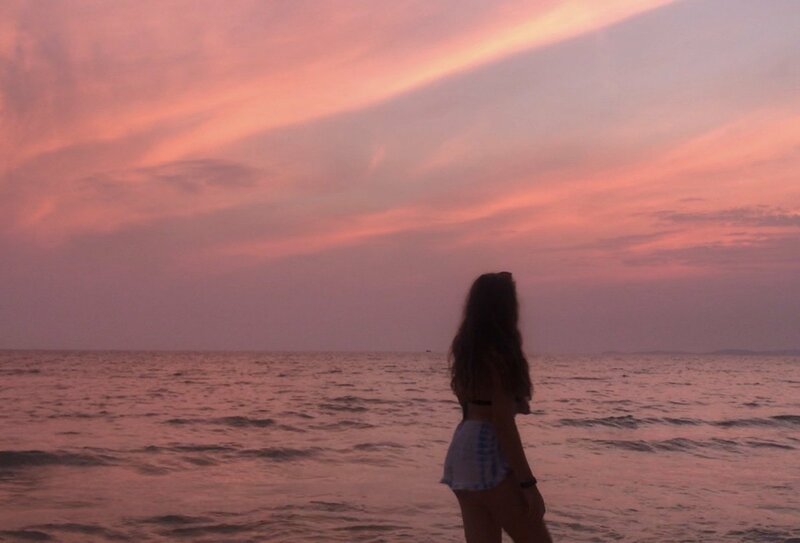 Watch the sunset on Cambodia's best beaches! Day 30: Arrive in Siam Reap, home to the world famous Angkor Wat! Day 30: Arrive in Siam Reap, home to the world famous Angkor Wat! 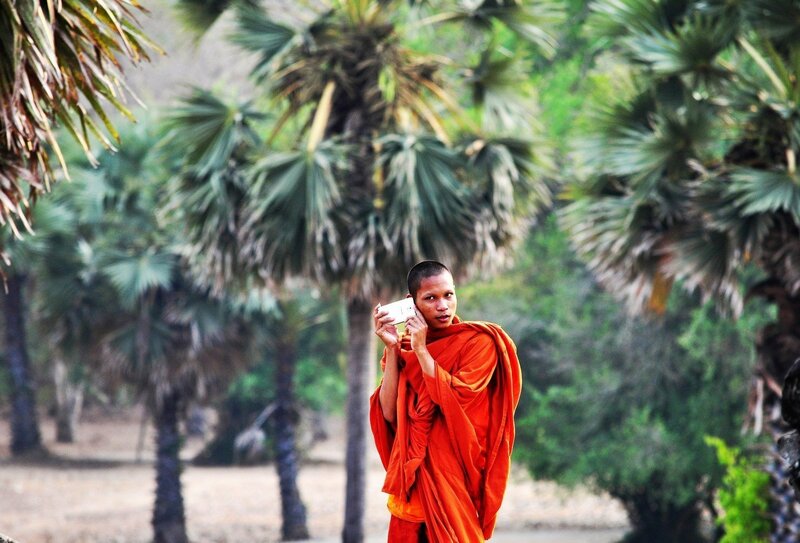 Day 31: Watch the sun rise over Angkor Wat, and then explore the area's many temples! 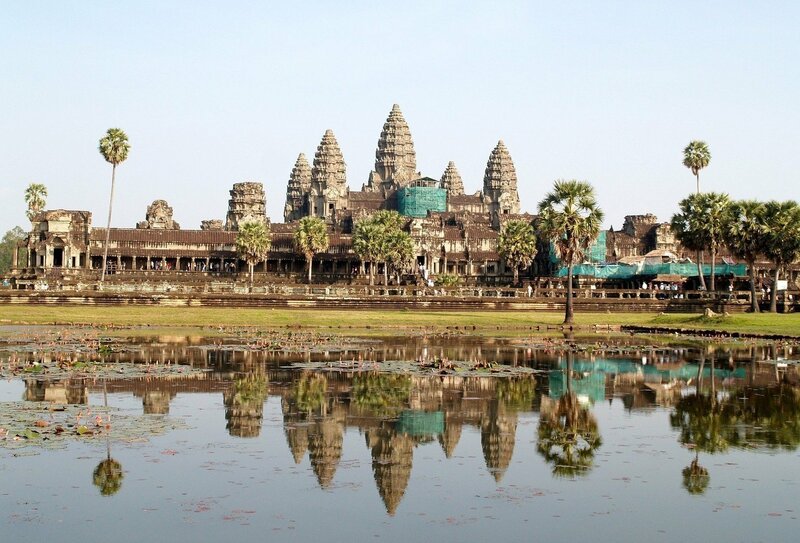 Day 31: Watch the sun rise over Angkor Wat, and then explore the area's many temples! Day 32: Hop back over to Thailand, and arrive back in Bangkok! Day 32: Hop back over to Thailand, and arrive back in Bangkok! Group night on Pub Street, Siam Reap! Day 33: Say goodbye to your new friends, or carry on the adventure in Asia! 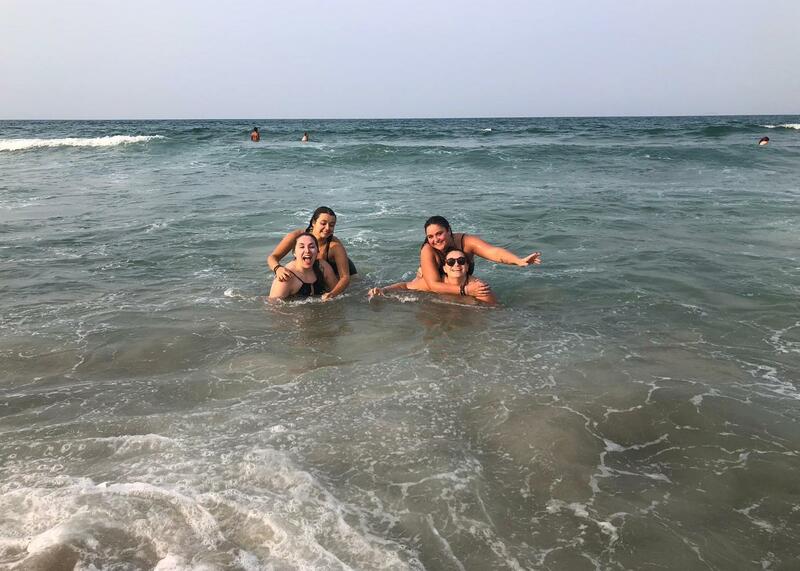 Day 33: Say goodbye to your new friends, or carry on the adventure in Asia! 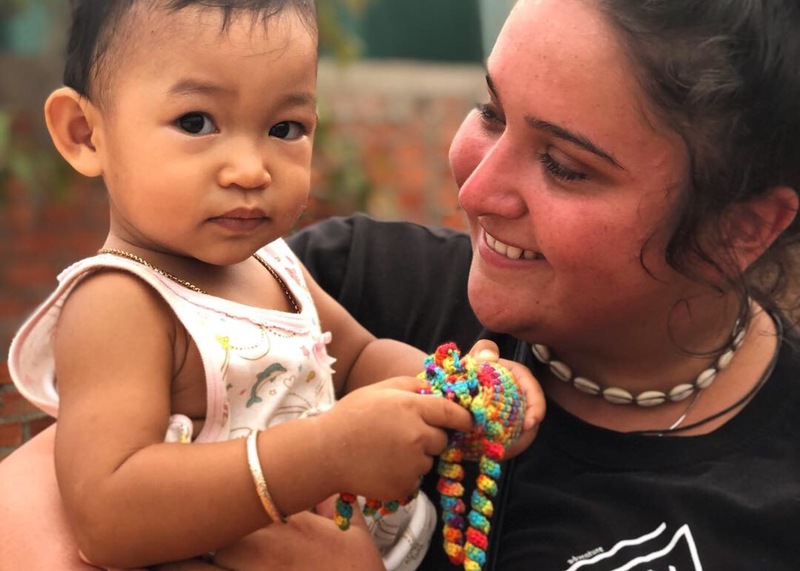 Make new friends in Southeast Asia! Explore Southeast Asia's best beaches with Gap 360! Watch the sun rise at Angkor Wat! Having a blast in Halong Bay! 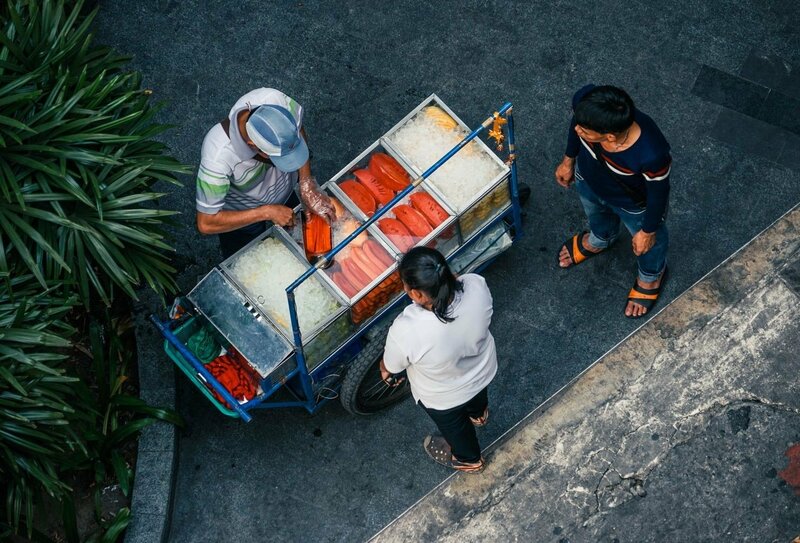 Enjoy classic backpacker experiences on this shoestring adventure around Southeast Asia! See stunning sights, meet exciting new people and fall in love with this incredible part of the world. Day 1: Bangkok, Thailand. 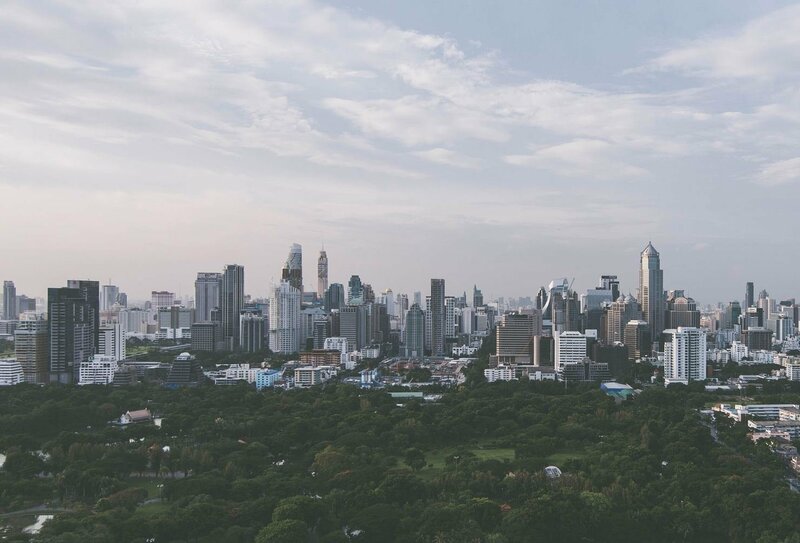 Arrive in the morning into the buzzing city of Bangkok. 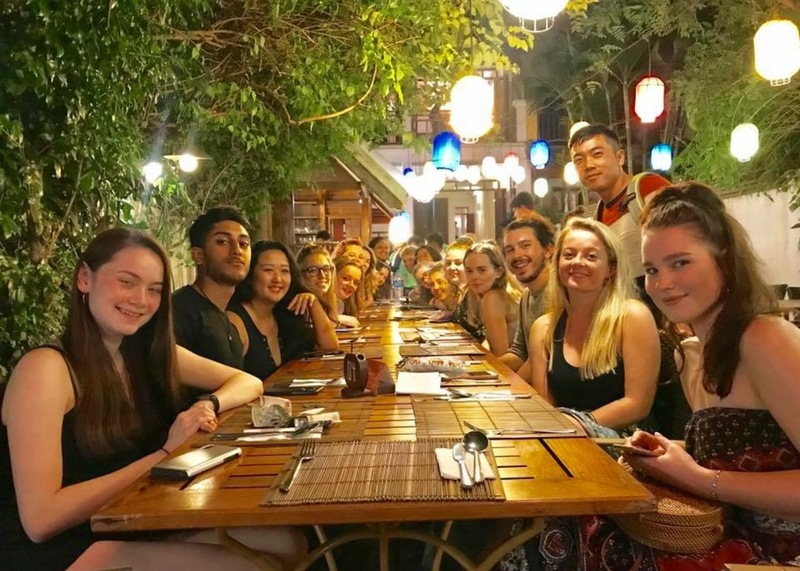 Meet your group at a 5pm, welcome meeting, and enjoy a drink together before boarding a sleeper train/bus to Chiang Mai. Please note, as the welcome meeting for the trip is at 5pm, after which you will leave for Chiang Mai, we recommend that you arrive into Bangkok at 1pm at the latest. 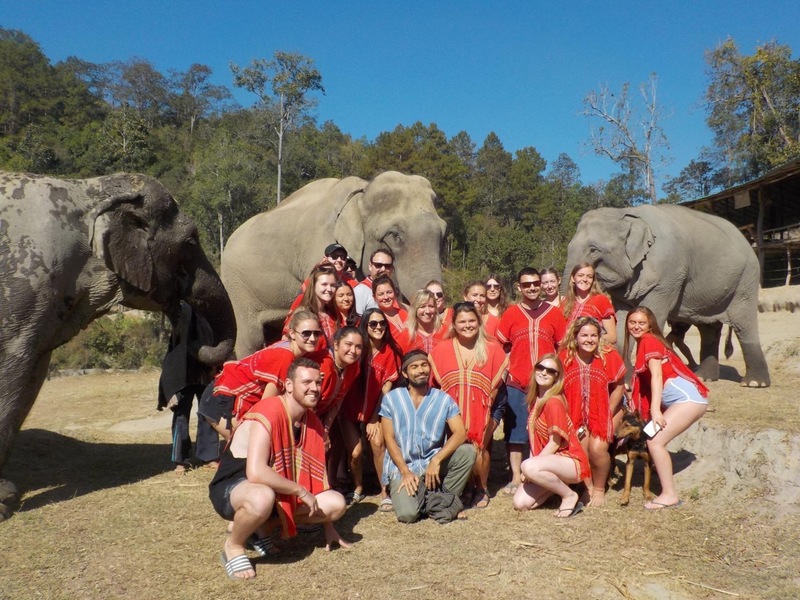 If you would like to arrive a day early, and also have a extra night included at the end of the trip, please select the ‘Southeast Asia Adventure (with pre/post nights)' option when booking the trip. Day 2: Chiang Mai, Thailand. Wake up as the train rolls into beautiful Chiang Mai. Meet some elephants at a local run sanctuary! This evening, venture into the city and explore the food market. Optional cooking class. Day 3: Chiang Mai, Thailand. Enjoy a free day to make the most of this awesome city. Get involved with optional adrenaline activities, including zip-lining, ATV riding and rafting. This evening, enjoy a night out with your group. Day 4: Chiang Mai, Thailand. Enjoy another free day with plenty of optional activities to choose from. Why not try your hand at a Thai cooking class or get cultural with a visit to Wat Doi Suthep temple? Day 5: Chiang Dao, Thailand. Head to the outskirts of Chiang Mai and cycle through some remote northern villages. Spend the night in unique tree top houses in a local settlement called Mae Mae. Day 6: Chiang Dao-Chiang Kong, Thailand. Wake up as the sunrises over your stunning treetop home! 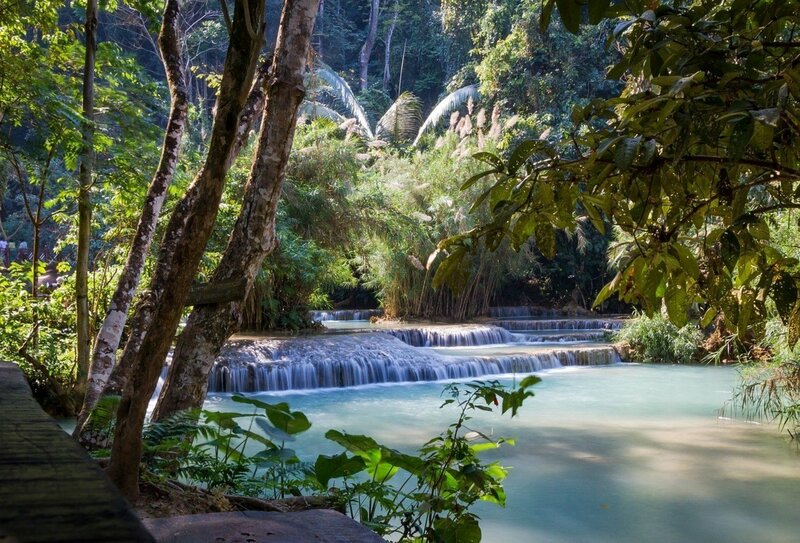 Trek through the dense jungle to stunning waterfalls in the morning before heading to the Laos border. Day 7: Thailand – Laos. Cross the border into Laos this morning and climb aboard a slow boat which will gently transport you to Pak Beng village. Watch the landscapes melt by as you cruise along the river and enjoy a beer on deck. 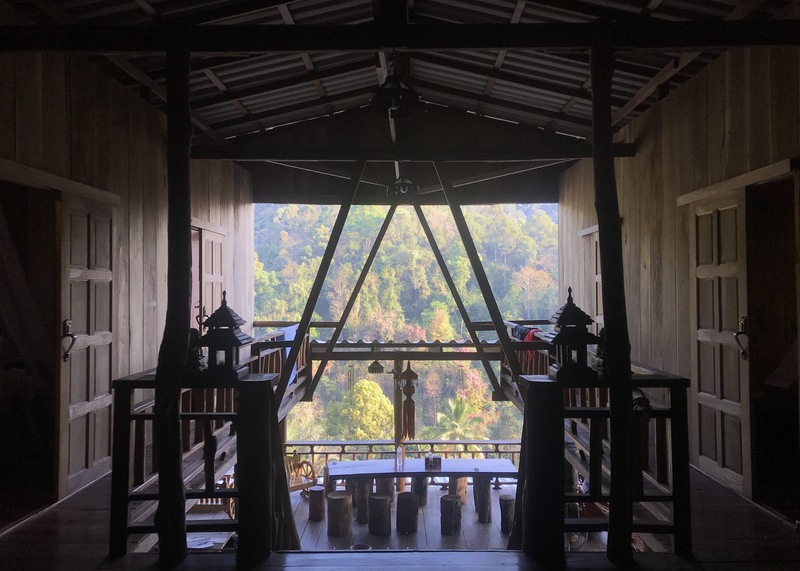 Day 8: Pak Beng – Luang Prabang, Laos. Back on the boat today as you make your way down to Luang Prabang, an ancient royal capital. 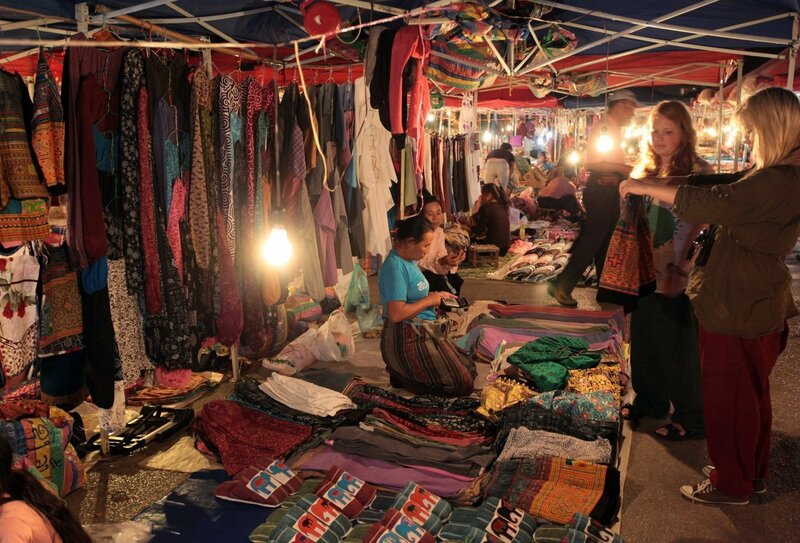 Delve into bustling Hmong Market and watch the sunset over a few drinks with your travel pals. Day 9: Luang Prabang, Laos. Volunteer with some local kids this morning before cooling off in the impressive three-tiered Kuang Si waterfalls. Jump, slide and splash in this stunning location! 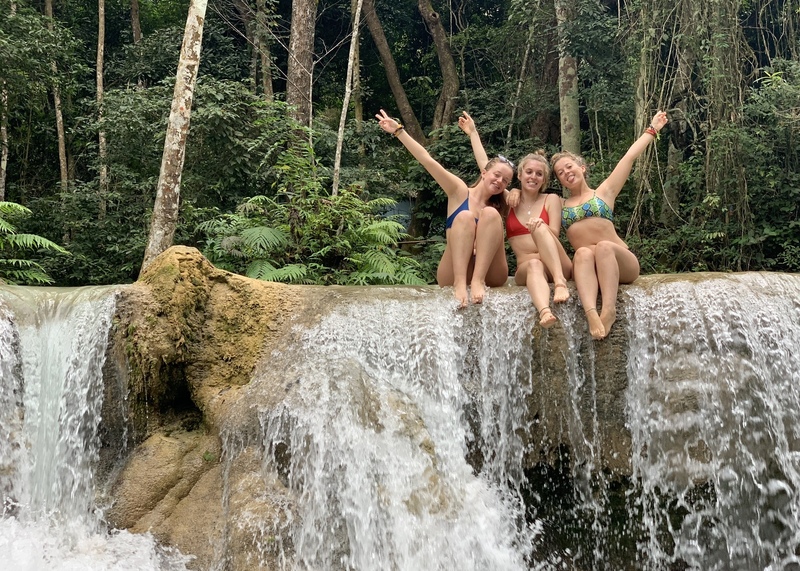 Day 10: Luang Prabang – Vang Vieng. Travel to Vang Vieng today, stopping at the stunning Blue Lagoon to cool of on the journey. 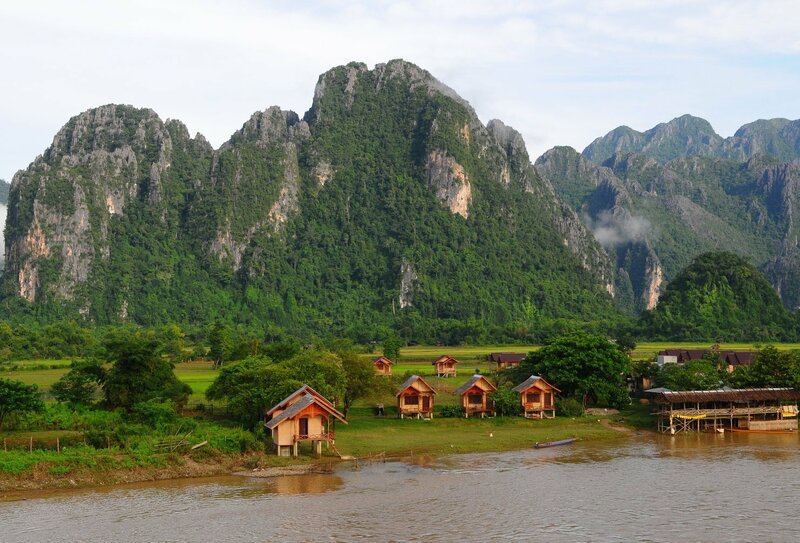 You’ll arrive in Vang Vieng in the late afternoon, giving you plenty of time to explore this buzzing backpacker hub. Day 11: Vang Vieng, Laos. A free day in Vang Vieng today. 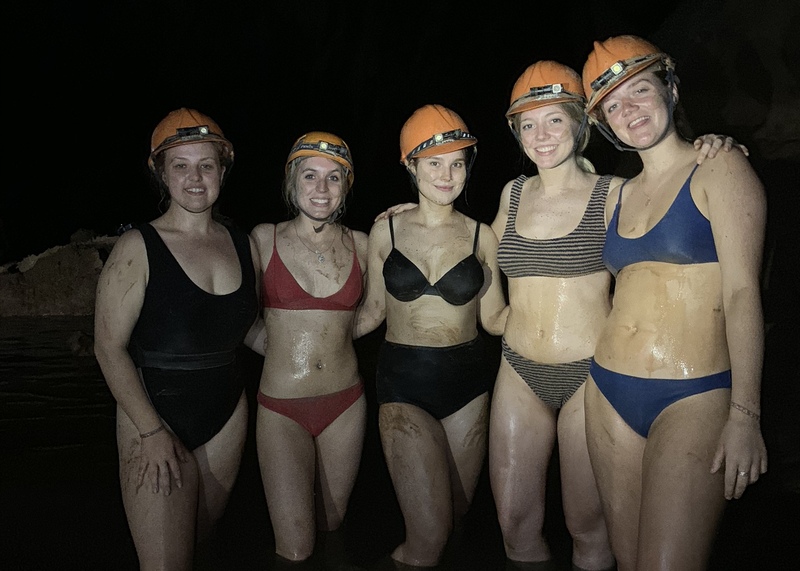 Live the classic backpacker lifestyle or get involved with some awesome optional activities, including a swim in the dark at NumbukkaFabu cave. Day 12: Vang Vieng, Laos – Hanoi, Vietnam. Take a short flight to Hanoi in Vietnam. Explore the Hoa Lo prison by day and enjoy a bar crawl around the beautiful Old Quarter by night. Day 13: Hanoi, Vietnam. Enjoy a visit to the Ho Chi Minh Museum and Imperial Citadel, where you can learn about the history of communism in Vietnam. Day 14: Hanoi, Vietnam. 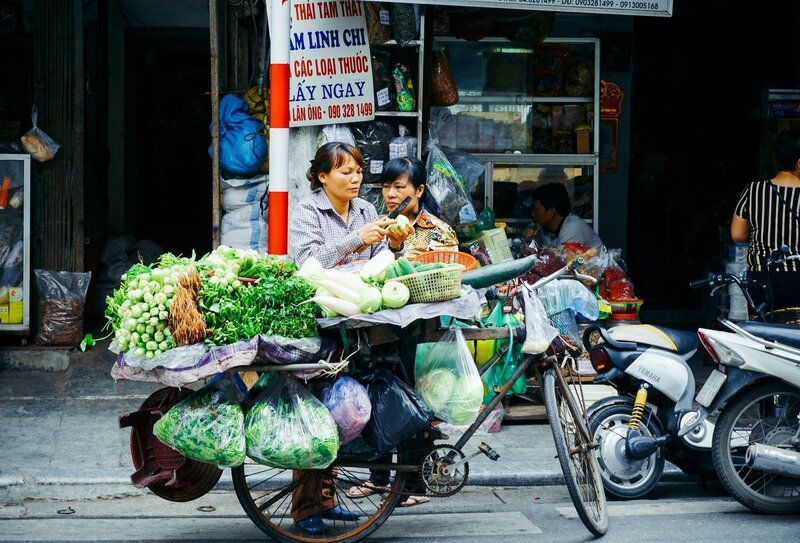 Take a day to relax from the fast paced tour and explore Hanoi Old Quarter by foot. There are lots of optional activities in this compact capital city such as cooking classes, water puppet shows and street food tours. Day 15: Halong Bay, Vietnam. 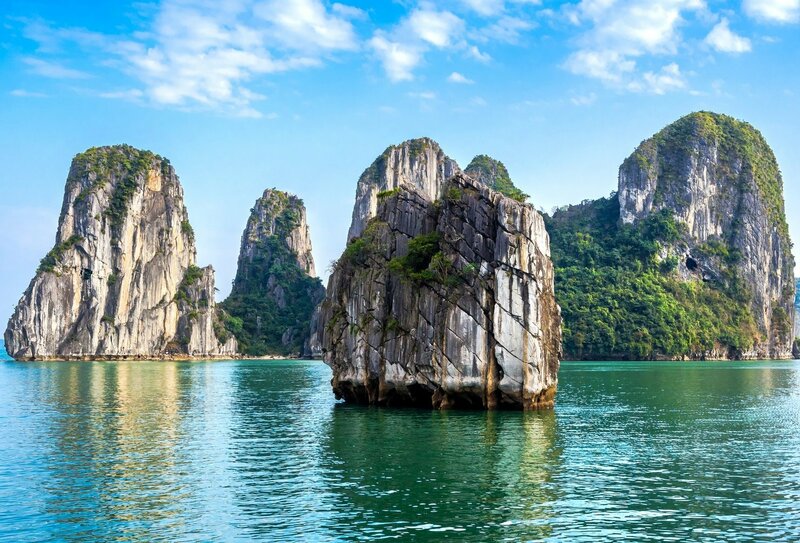 Travel to Halong Bay, a stunning area of tranquil waters and soaring karst peaks. Enjoy an afternoon boat cruise. Then party the night away on the beach. Day 16: Halong Bay, Vietnam. Meet the cheeky monkeys who roam the area this morning and try your hand at kayaking. This afternoon, travel back to Hanoi and then take an overnight bus to Phong Nha, arriving at 4am tomorrow morning. Day 17: Bong Lai Village, Vietnam. Opt to cycle into nearby Bong Lai village and visit the ‘Pub with Cold Beer’. No prizes for guessing what they serve! Then spend the evening singing your heart out at some group karaoke. Day 18: Phong Nha, Vietnam. Have a free day to explore this stunning down. Why not explore the stunning coastal caves of Phong Nha, or try your hand at some optional activities including mud-floating, zip-lining and kayaking. This evening is yours to spend as you wish. Day 19: Hoi An, Vietnam. Hop on a 4am bus to Hoi An, arriving around midday. Explore the old town, wander along the river front and check out the wonderful Japanese and Vietnamese architecture that can be found here. Day 20: Hoi An, Vietnam. 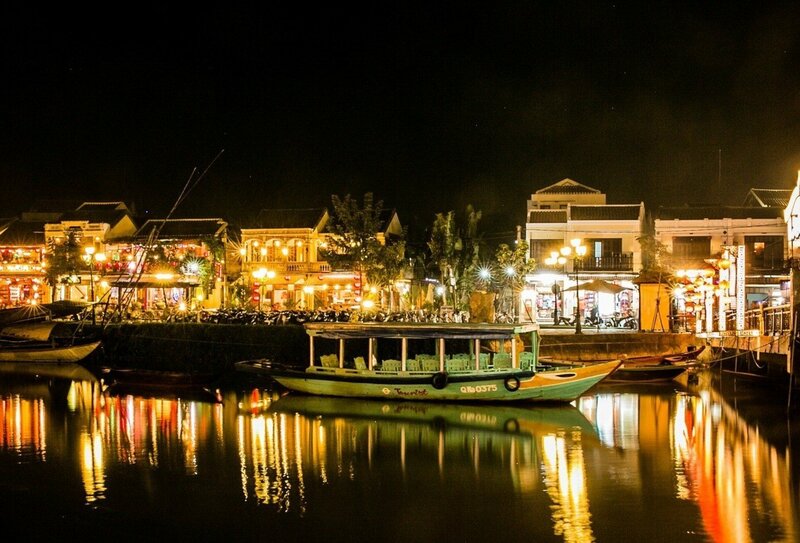 Enjoy a free day to make the most of Hoi An. Why not dedicate the day to soaking up the sun on the beach? Day 21: Ho Chi Minh City, Vietnam. Transfer to the city of Da Nang this morning where you will then fly to Ho Chi Minh City, arriving late morning. 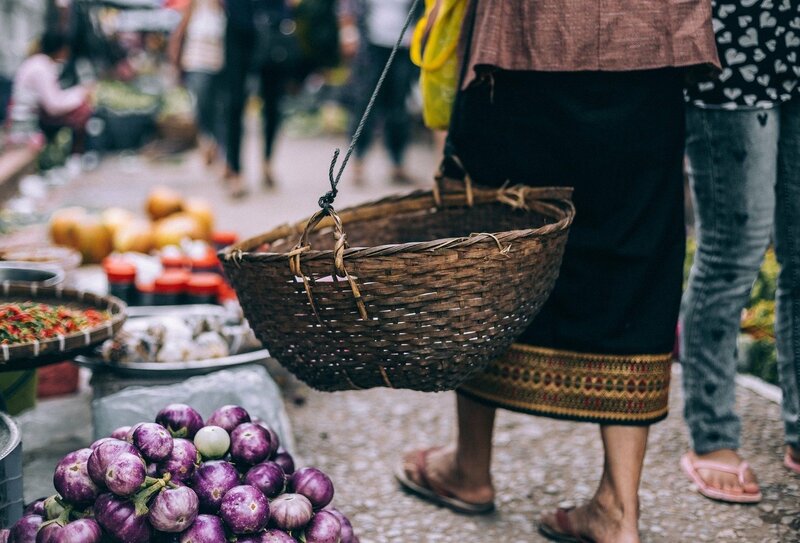 Head down to Ben Tanh Market for unique clothes and tasty street food. Day 22: Ho Chi Minh City, Vietnam. Use your free day to head underground to explore the Cu Chi tunnels, which were used to smuggle people and supplies during the Vietnam war. This afternoon, you can opt to visit the War Remnants Museum and learn about the devastating effects of the Vietnam war or explore the city for yourself. Day 23: Mekong Delta, Vietnam. Discover the stunning Mekong Delta today, with its floating markets and tranquil forests. Explore Tra Su Forest by boat and navigate the plants that grow from the water. Arrive at your hostel this evening in Chau Doc. 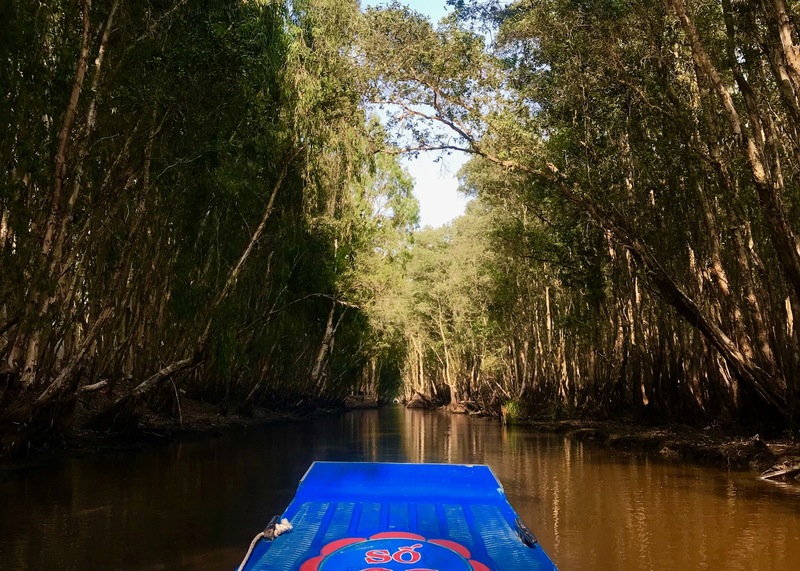 Day 24: Chau Doc, Vietnam – Sihanoukville, Cambodia. Cross the border into Cambodia and travel to Sihanoukville beach. From here you will transfer to KohRong, an incredible paradise island of beach relaxation and nightly partying. Day 25: Koh Rong, Cambodia. 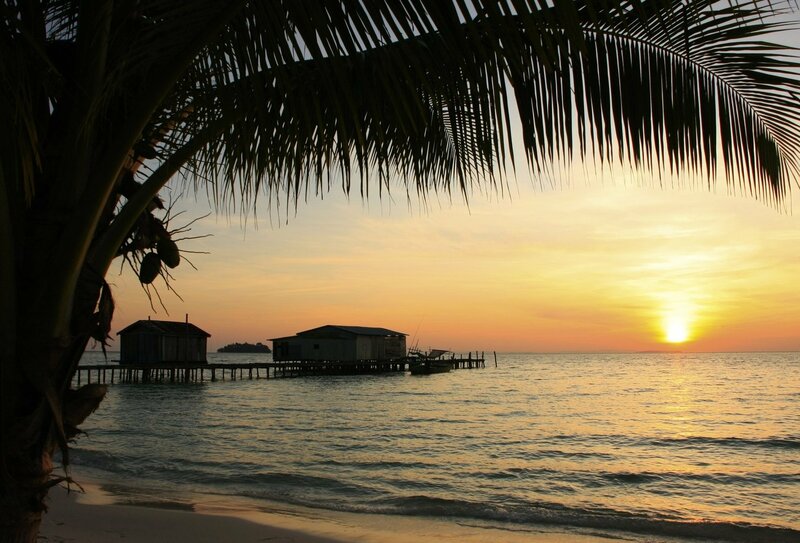 Spend the day making the most of legendary Koh Rong. 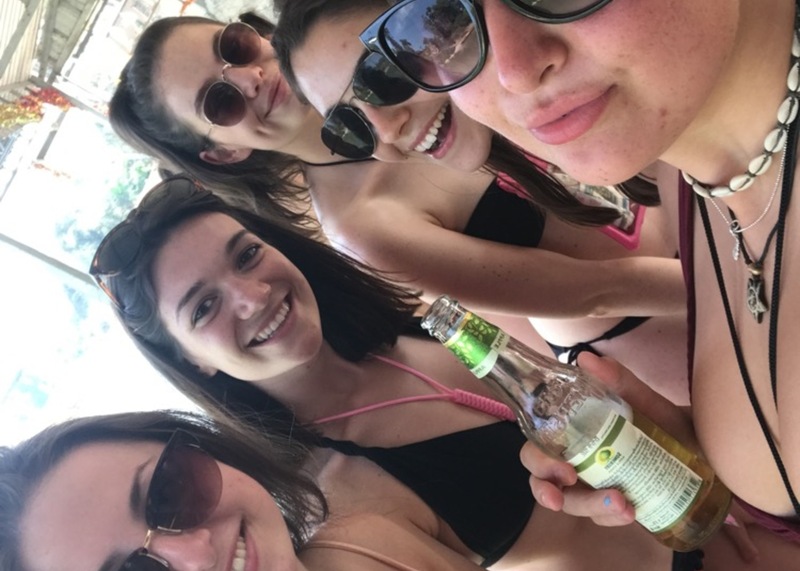 Stretch out on the beach, grab a cocktail, meet other backpackers and have the time of your life. Day 26: Koh Rong, Cambodia. Enjoy a full day boat cruise today! Hop between exquisite local islands, visit traditional villages, snorkel in the shallows and get up close to wonderful wildlife. Tonight, you will sleep under the stars on a hammock on a deserted beach. Keep an eye out as the sun sets – when it gets dark the sea lights up with hundreds of luminous plankton! Day 27: Sihanoukville, Cambodia. Today is dedicated to making your way back across the islands and transferring to Sihanoukville. From here, you’ll hop on a bus that’ll take you to Phnom Penh, arriving at around 6pm. Day 28: Phnom Penh, Cambodia. Learn about Cambodia’s tragic past with a visit to the infamous S21 prison. 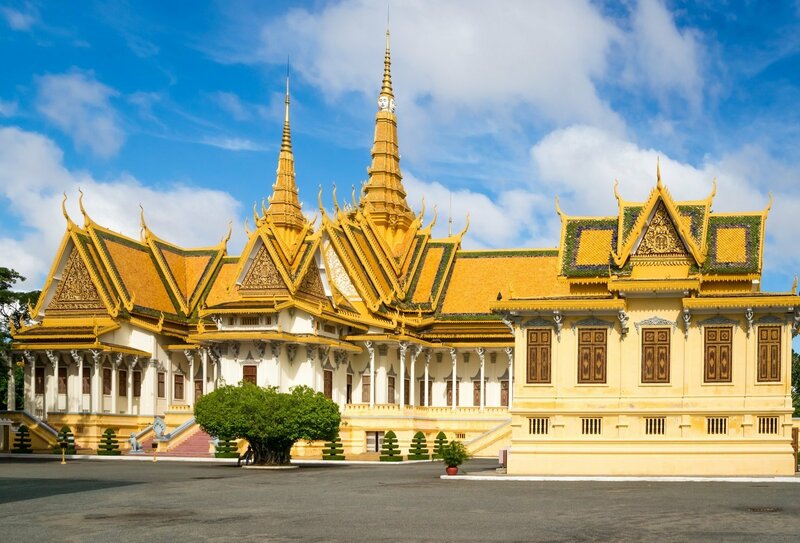 Take an optional visit to the exquisite Grand Palace and round off the day with a night out in Phnom Penh. Day 29: Siem Reap, Cambodia. 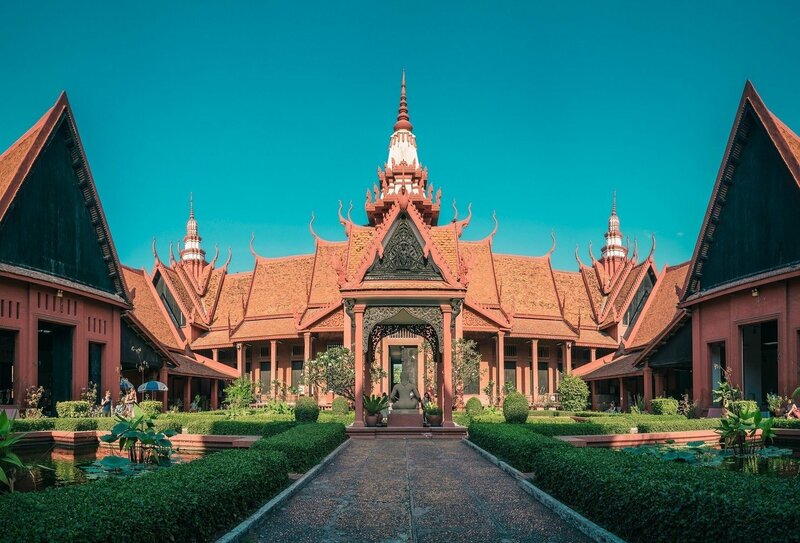 Leave Phnom Penh behind and travel to Siem Reap. In the afternoon, you can try some weird and wonderful local delicacies, including beetles and bugs! Day 30: Angkor Wat, Cambodia. 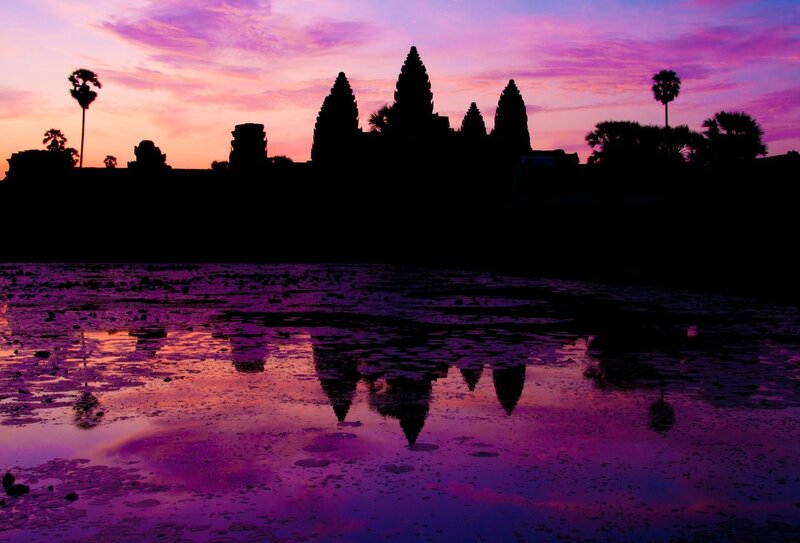 Kick off the day with a visit to Angkor Wat at sunrise. This stunning temple complex is a real highlight of the trip. After a day of temple touring, kick back by the pool. 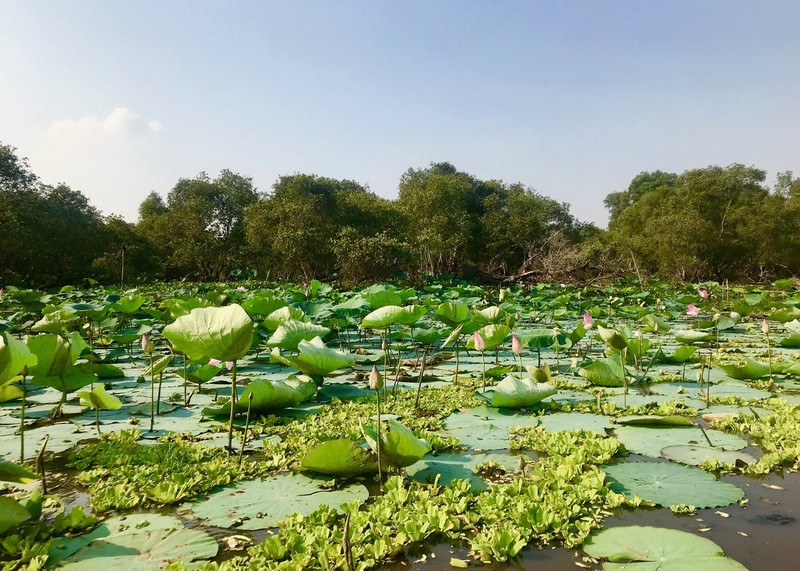 Day 31: Siem Reap, Cambodia – Bangkok, Thailand. Come full circle and take the bus back to Bangkok today in the late afternoon, where the trip ends. Say goodbye to your group, or stay on in Asia for more adventures. Please note that accommodation isn’t included for night 31 on the trip. If you would like to include accommodation for this night, and also the day before the trip ends, please select the ‘Southeast Asia Adventure (with pre/post night option)' when booking the trip. Please note: All itineraries and activities are subject to change. The order of activities may change due to local conditions. Your tour begins on Day 1 of the trip in Bangkok, at the welcome meeting at 5pm. We recommend that you arrive no later than midday on day 1 to ensure you are there for the welcome meeting. An arrival transfer is not included but is easy to arrange. Speak to a travel advisor for more advice about arrival. Your trip ends on day 31 back in Bangkok at approximately 4pm. You can either book an extra night of accommodation and depart the next day (please select the ‘Southeast Asia Adventure (with pre/post nights)’ option when booking if you would like to include an extra night of accommodation when you arrive and when the trip ends), or head off immediately with a post 10pm flight. Many of our travellers prefer to book an extra night in Bangkok before flying home the following day. 30 nights of simple multi-share mixed dorm accommodation are included on this tour. Some nights will be spent on overnight buses and trains. The dorms sizes vary between 6-12 beds. 19 breakfasts, 9 lunches and 5 dinners are inlcuded in the trip. For meals that aren't included, this is a great chance to immerse yourself in Southeast Asian culture. Food here is mostly very cheap and so eating out won’t break the bank! 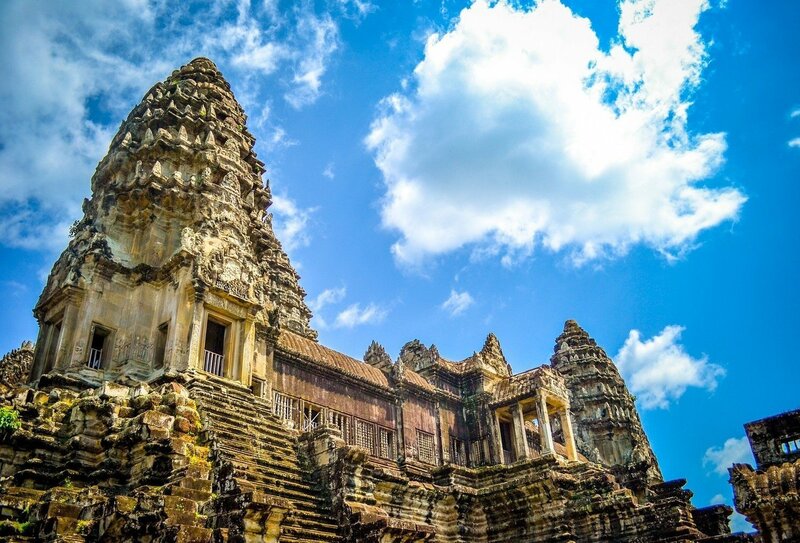 You will need visas in order to enter Cambodia and Thailand if you plan to remain for durations of longer than 30 days. These MUST be obtained before you travel. Cambodia: Cambodian visas can either be obtained online, or upon arrival at the border (where you would need to pay the USD 35 fee). Thailand: Your visitor stay duration varies depending upon how you plan to arrive into Thailand. Without a visa, British nationals arriving by air can remain in the country for a maximum of 30 days, though if you arrive across a land border this will be shorter. 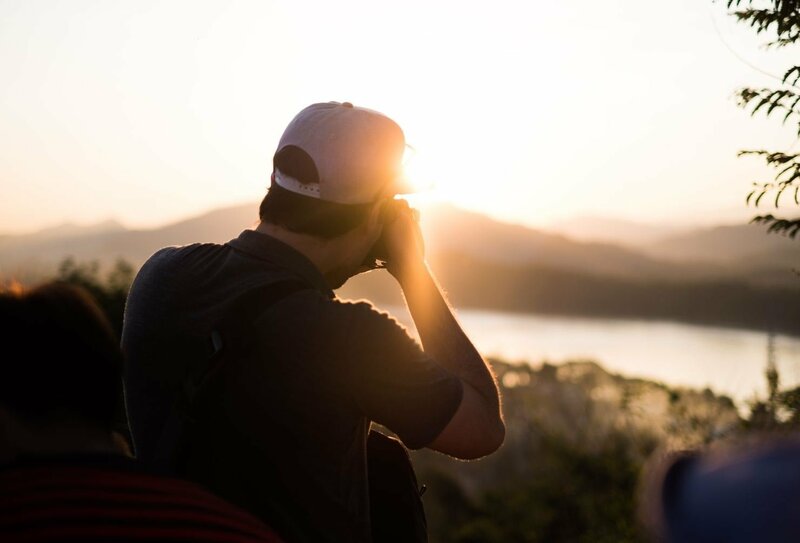 If you wish to stay for longer, or plan to begin employed work during your stay, then you will need to apply for a visa before you depart the UK. If you are not planning on working this will be in the form of a 60 day tourist visa. Customer Photo Caves in Vietnam!